This entry was posted in Connecting with Community, Food Glorious Food and tagged eat local, joost bakker, meal for a meal, no waste, oz harvest, think eat save by cityhippyfarmgirl. Bookmark the permalink. I am so glad there are people doing this work. It is so valuable. Is in indeed Ms Maeve O’Meara, standing along side a few big chef’s, with Joost Bakker and obviously everyone’s favourite garden gnome Costa above them. I agree, those words of yours…’ let’s all just try a bit harder’. That right there, if everyone just stepped up a tiny bit more would have a massive follow on effect. Seriously, we have to do better than what we are. Oz Harvest is such a great organisation – just love what they do, but as you say we need to take control of our own waste! Thax for sharing – Brydie. How are things in NZ Rachel? Any great composting/waste management programs? This is such an important issue isn’t it Brydie. I look forward to reading more of your thoughts on this. I love that photo of Costa and the chook! it sounds like Oz Harvest do some incredible work. That chook is Sally and was quite delightful- one incredibly tame chook of Costa’s! And yes, more to come on this one, that’s for sure Jane. Wow, thanks for sharing! We all need to make a difference in order to save the planet and this is a great way to achieve this goal. I hope this idea spreads around because the amount of food that is wasted is truly a shame. The amount of food wasted is ridiculous isn’t it. It doesn’t have to be like that though, there are plenty of other countries that are leading the way with brilliant ideas. We just have to get things together better. 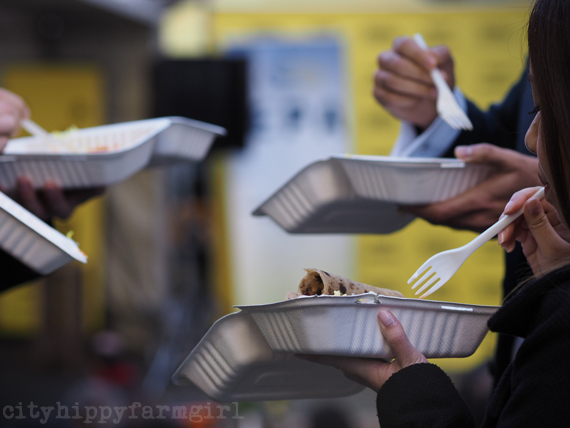 The work OzHarvest and other food rescue groups are doing is SO important. Helping to feed those who would perhaps not have a good meal during the day and bringing to people’s attention the amount of food that goes to waste. It makes us all rethink what we buy, how we use it and what to do with the food that may not be used. 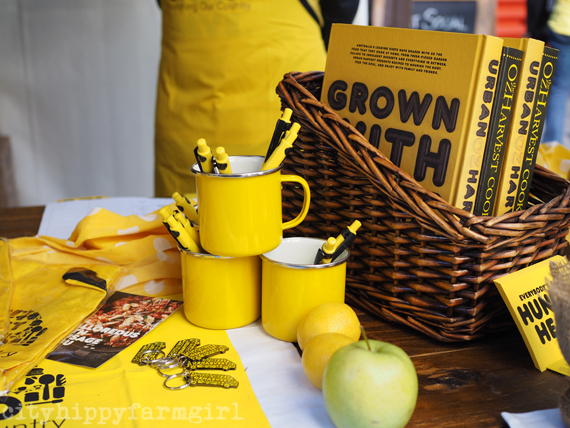 I am doing some volunteer work for OzHarvest Perth and am very grateful I can be a part of it. Meal planning, something that was not a habit of mine, is growing better by the day. The food not consumed is going to my worm farm, which is now supplying my garden with beautiful vermijuice and castings to produce the food I eat. It’s a wonderful cycle at home. But outside of the home, when I eat out, I now think always of what may be going to waste when I see returned half eaten meals. And what of the end of day produce not used? I cringe too. Thank you for sharing your thoughts. Wonderful to hear from you Simply Be, and fantastic to hear that you’re involved with the Oz Harvest Perth. I don’t do a whole lot of meal planning but I’m pretty good with making something out of whatever is on hand. The challenge of something delicious out of a couple of flaccid carrots and a quarter of a cabbage is a weird challenge that I love. As for eating outside, yep, it hurts doesn’t it. I’ve often wondered if I would dare take what’s been obviously left on someones plate after they’ve left. Ego, get’s me every time unfortunately. I’d really love to reblog this post on my page, but can’t find the icon? Sorry Simply Be I don’t have one for reblogging. 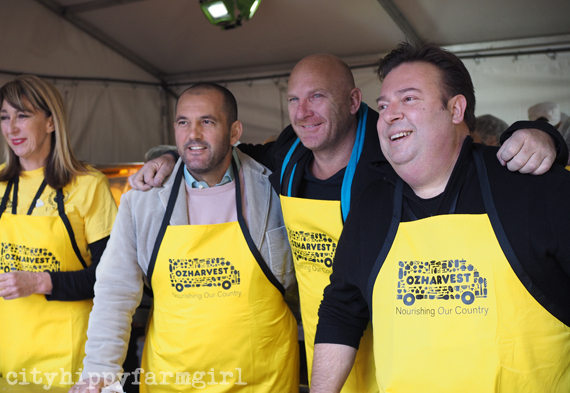 I absolutely love what OzHarvest do and thank you for the pics from the event! I wasn’t able to go but I was curious to see what it was like! Pretty awesome Lorraine, that’s how it was. Come next year! OzHarvest is my favourite charity, actually posted about OzHarvest this week too. I am one of Canberra’s Ambassadors, so I fly the flag for this organisation as high and loud as possible. My household takes food waste very seriously, very rare to find any leftovers, it will always be reused in another dish or frozen for eating down the track. 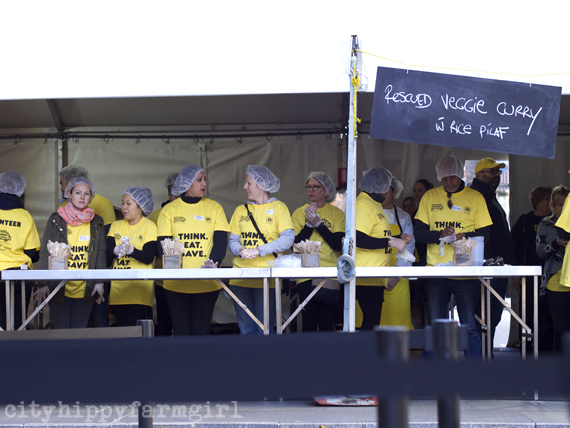 We had about 600 cups of soup handed out at our event, pretty great I reckon. 🙂 Looks like you guys had a brill day too. I remember the first time you posted about Oz Harvest in Canberra Anna way back when. That’s so wonderful that you did 600 soups on Monday, that’s pretty damn amazing I say. Lots of celebrity chefs there CL. Some I knew, some I had to double check. I think it’s great that they are putting their names to a wonderful charity like this though. Beats plugging cat food ads…err, not that I’ve seen any do that. I’ve read about a couple of films on food waste recently (it might have even been through you Brydie) one on a couple trying to have zero waste for a year, and one about living on what is thrown out in supermarket dumpsters – a real eye opener!